The Center for Disease Control and Prevention (CDC) is pushing parents to vaccinate their children between the ages of 6 months to 19 years against the flu as the coming flu season is being touted as the worst year yet. In North America, this combination influenza vaccine is approved as of February by the Food and Drug Administration (FDA) at the Vaccines and Related Biological Products Advisory Committee (VRBPAC) based on the composition of the influent vaccine as dictated by WHO. The CDC works with WHO and the laboratories that concoct these inoculations. The dangers of the flu vaccine are evidenced in the death of a 6 year old girl in January of this year. In an independent report, after the child had an annual physical where she was given the flu vaccine, she died within 4 days. In Vermont, where the child died, Dr. Harry Chen, the state health commissioner declared that because death related to the flu vaccine is “very rare” and that there are little reports connecting vaccines to mortality, it is not possible to link the child’s death to the vaccine. In an effort to hide the correlation between flu vaccine and mortality, the US government set up the Vaccine Adverse Events Reporting System (VARES) to file documentation of adverse reactions to vaccinations. On their website, they admit the connection between febrile seizures in infants and children after receiving the flu vaccine – which is the most common reaction to the inoculation. Coincidentally, high fevers, seizures and sudden infant death syndrome (SIDS) are also associated with flu vaccines. In May, the CDC campaigned to convince all Americans be vaccinated as a necessity to facilitate good health. They told doctors to pressure their patients into being inoculated and created guidelines on how to coerce the public without causing a panic. The CDC also drafted a recommendation in the same month that ALL Baby Boomers (people born between 1945 and 1965) be tested for the hepatitis C virus and subsequently vaccinated. By claiming that Baby Boomers were part of the rampant drug use involving needles in the 1980s as well as the surge in blood transfusions of the same time period, they are classified as being more susceptible to hepatitis C and for the sake of public safety, must be vaccinated en masse. New vaccines are being manufactured using patented GMOs mixed with human DNA which creates broken information that are read by the cells of the body and directly translates to disease in the body. And in efforts to get more parents to vaccinate their children, initiatives like the Oregon ALERT Immunization Information System tracks children and their parents who display “anti-vaccine attitudes” in the Portland metropolitan area. Oregon health officials have been motivated to purvey pro-immunization propaganda onto the citizens of Portland in response to a recent study. Disregarding that the study was solely based on doctor reports and not scientific empirical data, the health officials in Oregon have been deployed to focus their attention on coercion and fear-mongering. In Illinois, school officials have used the National Infant Immunization Week to coerce parents into vaccinating their children by claiming that their children will be denied admission into school if they cannot prove they have received their D-Tapp inoculations. Although no significant outbreaks of disease were recorded, officials pushed the requirement that would cause vaccination to become mandated under state law. In addition, school healthcare officials were allowed to vaccinate these minors with their consent; which is usually given after the fear has set in. Because of the impressionable age of these teenagers, and the rule, school officials are able to curtail any legal responsibility. 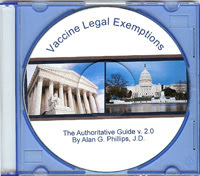 Parental consent was not a necessity prior to vaccination – only the minor’s acknowledgement. In April the FDA admitted within a federal case showed that the Food and Drug Administration (FDA) not only know about thimerosal (a mercury based preservative known to cause neurological damage), but endorse its use in vaccines such as the influenza vaccine that is now given to infants as young as 6 months old. With his decision, Judge Brett Kavanaugh effectively invalidated the Coalition for Mercury-Free Drugs (CMFD) lawsuit and set precedent for future suits against the FDA and pharmaceutical corporations that knowingly use mercury-based preservatives such as thimerosal in their vaccines. Adding insult to injury, the FDA and the Center for Disease Control and Prevention (CDC) continue to lie through propaganda and disinformation to the public about the real danger this preservative is to children’s neurological development. Serious consideration must be taken by parents when vaccinations are suggested and even strongly advised by your child’s pediatrician. It is common for those who are receiving kickbacks from the drug companies to be overtly forceful when it comes to administering vaccinations to children. However, as your child’s first advocate, do not allow their bullying or coercion to cloud your judgment. If the additives in the vaccines are linked to the effects listed above, it is unsafe for your child. Period. Regardless of what the FDA, CDC or your pediatrician advises you. These vaccines are too much of a risk to your child’s health and wellbeing to be worth the “risks” associated with not vaccinating. Be the first to comment on "CDC Pushes Flu Vaccine for Children in New Fear-Mongering Campaign"